The period charm of this 16th Century farmhouse extends throughout, from feature fireplaces and exposed beams, to bespoke internal doors and original brickwork. A spacious reception hall leads to a large drawing room with wood burner, triple aspect windows and beautiful exposed beams. The dining room is generous in size, with a delightful inglenook fireplace and wood flooring, and access to the rear terrace and gardens. Adjacent to this is a sizeable study with views over the front garden. A further family room with access to the gardens is ideal as a games room, play room or further sitting area. The kitchen/breakfast room is a wonderful family space featuring ample storage, granite work surfaces, modern appliances and a breakfast bar. The high ceilings and French doors opening to the rear grounds create a spacious and light atmosphere. The kitchen opens on to a utility room with walk-in larder and downstairs shower. On the first floor is a large en suite master bedroom with triple aspect windows and a feature roll top bath, high vaulted ceilings and an adjoining WC. 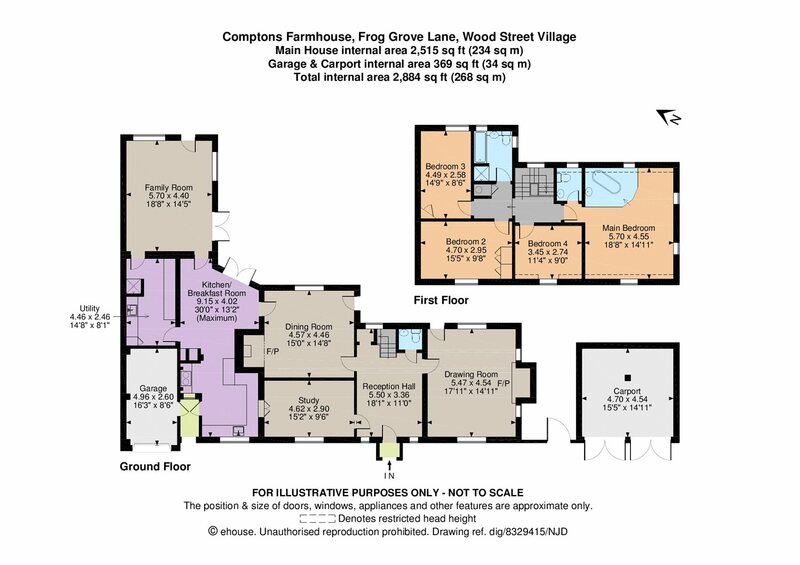 There are a further three bedrooms, served by a modern family bathroom. The property is situated in the village of Wood Street. A quintessential village green with the only surviving Maypole in Surrey sits at the heart of the village. Amenities include a Post Office, General Store and two country pubs, notably the White Hart with its popular restaurant. Cycle routes and scenic paths allow access to miles of open countryside. The Christopher Robin Nursery is in the village, along with excellent schools in the immediate area, both in the state and private sectors, which include Wood Street Infant School, Worplesdon Primary, Rydes Hill, Aldro, Hoe Bridge, Charterhouse, Prior’s Field, Royal Grammar, Tormead and Guildford High. The property is set behind a substantial front garden with a generous double entrance driveway. There is a single garage and an enclosed double car port. Extensive grounds to the rear of the house, with swimming pool and expansive paddock offer a wonderful sense of space and privacy, with views of wooded hills beyond. 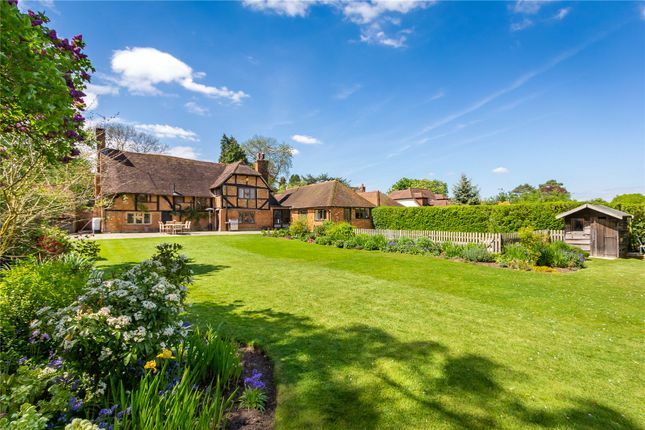 Property descriptions and related information displayed on this page, with the exclusion of Running Costs data, are marketing materials provided by Strutt & Parker - Guildford, and do not constitute property particulars. Please contact Strutt & Parker - Guildford for full details and further information. The Running Costs data displayed on this page are provided by PrimeLocation to give an indication of potential running costs based on various data sources. PrimeLocation does not warrant or accept any responsibility for the accuracy or completeness of the property descriptions, related information or Running Costs data provided here.